It was a terrifically successful spoof of a working class that injected such phrases (briefly) into the language as “hose-heads” and “no way” and “take-off.” Many Canadians enjoyed it as much as Americans. Many did not. However…most intelligent folks north and south of the 49 Parallel knew it was a skit. That knowledge seems to have been lost on the impresarios of Fox News. After other such comments as “this ridiculous nation” and “we should invade,” the response was not long in coming, which included thousands of YouTube and FaceBook reactions north of the border, a stinging rebuke from Canadian-born conservative columnist David Frum (NewMajority.com), and an official complaint by Canada’s Defense Minister Peter MacKay. An apology of sorts was forthcoming from both Fox and Gutfield. To say the least. That very week, four Canadian soldiers were killed and eight more wounded in operations that involved the largest joint U.S.-Canadian offensive since the Korean War. To get a comparison, you have to think in terms of 10%. Canada is - very roughly -10% of the population, economy, and output of the United States. If you can imagine forty American soldiers killed in Afghanistan in one week, you can get some sense of the proportion, the tragedy, the upset. In October 2008, Kevin Myers, writing in the London Sunday Telegraph, asked the following: “So who today in the United States knows about the stoic and selfless friendship its northern neighbor has given it in Afghanistan?” U.S. Defense Secretary Gates well knows it, British historian Andrew Roberts speaks and writes about it, as do most informed observers on the conflict from Central Asia. Canada has been doing fairly steadfast service in Afghanistan since the first units arrived in 2002, as poorly equipped and under-prepared as they may have been, a situation castigated by Canadian voices above all. In 2005, after serpentine negotiations between Donald Rumsfeld’s State Department and the Canadian government, nearly 2300 Canucks honored Washington’s request to begin reassignment to what would become the most dangerous region of the country - the Taliban-infested area around Kandahar. 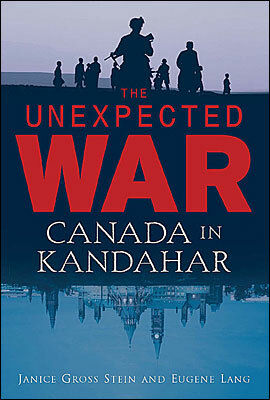 These facts are superbly documented in The Unexpected War: Canada in Kandahar (2007) by University of Toronto political scientist Janice Stein and policy critic Andrew Lang. They show how this deployment, steadily losing in popularity in Canada, came about essentially because of treaty obligations between the two countries dating back to 1949, the beginnings of the original NATO Alliance: if one nation were attacked, the others would come to its aid. On September 11, 2001, it was very obvious that the United States, the pivot of the NATO Alliance, had been attacked. The "United Nations...sanctioned the invasion of Afghanistan as a just war,” record Stein and Lang who also reveal that the now denigrated Defense Secretary Donald Rumsfeld did not want Canada in Iraq. (For Canada’s leaders, such a deployment was not in the cards in any case). Rumsfeld wanted the Canadian force in Kabul as a stabilizer to NATO forces - Dutch and others - still fighting there. Usually calm, even phlegmatic, Canadians instinctively bridle when their country’s military record is dismissed by some of their tragically uninformed neighbors. With typical judiciousness, Stein and Lang themselves report: “Canadians generally know little about their country’s history.” But one thing that hits home to those of a certain age north of the parallel - perhaps from the effect of so many small, well-kept military cemeteries that dot the countryside (and Northern France) - is the heart-rending human cost of Canada’s wars in the century just past. In August 1914, as part of the British Empire at the time, Canada entered World War I handily and heartily almost a full three years before the United States (April 1917). It famously took part in some of the heaviest fighting at Second Ypres and Vimy Ridge, Ypres being the first time mustard gas was used in battle. Ypres became a Canadian Thermopylae, accounting for some of the 60,000 casualties in a war that risked the break-up of the nation over a bitter majority-minority Conscription Crisis. This conflict left scars between the French and English that still remain. It was much the same in World War II, with internationally-attuned Canucks not hesitating to follow Britain and France to war against Hitler in September 1939 over the Nazi invasion of Poland - a long way from the banks of the South Saskatchewan - well over two years before Pearl Harbor. All of this blood, sweat, and effort make an ill subject for American television satire. Knowledgeable Canadians react viscerally when their sacrifices are mocked gratuitously by those who have never heard a shot fired in combat. But Canadians, as a people, have shown they can also be wise and patient and, above all, steady. They know that every country has its share of hose-heads. The trick is to keep them from the microphone.